I am a disabled cannabis user, with a prescription for a cannabis spray that my Primary Care Trust will not fund. I chose to grow my own and was caught; I subsequently refused a police caution and pleaded Not Guilty. At Snaresbrook Crown Court last week, I told the jury that although my conscience is clear, they should convict me. It seems a lifetime ago, but I was once a rock musician with a successful international career. In 2001, I developed a sensitive form of Coeliac Disease, an autoimmune condition that began to erode my health. By 2004 I was unable to play music, the pain and nausea had become intolerable and continuous, and I was suffering from malnutrition because I could no longer absorb nutrients. Then the prescription painkillers stopped working. Fortunately, I discovered the benefits of cannabis. For many thousands of people cannabis is the only medicine that reduces the pain, quells the nausea, stills the tremors, lifts the depression and calms the anxiety. When prescribed pharmaceuticals fail, we have the 'choice' of obeying a blunt and pointless law that demands either our passive agony, or opting for a life worth living by breaking it. This is no choice at all. Who in their right mind would accept the immediate imperative of chronic, untreatable pain against the remote threat of prosecution and conviction? Because so many of us can't derive pain relief through alternative means, and because it is a far, far safer alternative to alcohol, many millions of otherwise law-abiding Britons believe cannabis prohibition to be unfair and unworthy of obedience. "...we recognise that there are people like Mr Stratton, with severe pain and debilitating illnesses, who cannot satisfactorily alleviate their symptoms through the use of existing medication... That is why we have said that we would seek Parliament's agreement to make any necessary changes to the law to enable the prescription of cannabis-based medicine, for the purposes of relieving pain..."
I followed Mr. Coaker's advice, and in due course my medical need for cannabis was confirmed by my pain consultant. I became one of the few people offered a prescription for cannabis in its liquid form: Sativex, on the proviso that my Primary Care Trust would fund it. But in spite of comprehensive peer-reviewed evidence, my PCT declared that Sativex is not sufficiently proven for pain relief to justify funding. At first I tried buying cannabis on the street, as a less-risky proposition than growing it. But as a disabled person I felt extremely vulnerable hanging around the streets of East London. It's also the worst of all options because dealer-weed is frequently adulterated. I have bought cannabis laced with silica and glass; I have seen it contaminated with iron filings, and even lead dust. If I am to find relief at all, the only safe solution is to grow my own. 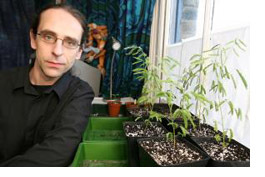 So, in February 2008, I began growing cannabis in my spare room. Three months later, my luck ran out when a neighbouring wine bar was firebombed. The conflagration spread, the police burst into my home to evacuate and found my plants. Arrested and bailed, a week later I was offered a police caution, which I refused on principle. To accept a caution would be as absurd as not growing chamomile for headaches. On 1st October 2008, I was charged with cultivation of cannabis. Eight days later I appeared at the Magistrates' Court where I moved to seek permission in the High Court for a Judicial Review of the decision to stand me for trial, on the grounds of unconscionable behaviour by the government. I asserted that I should not have to be before any court, that I was only in court at all because the Home Secretary had abused his powers by not applying the law fairly and equally to all drug users. The Misuse of Drugs Act 1971 is designed to control 'dangerous or otherwise harmful drugs' proportionate to the evidence of their potential for causing a 'social problem'. A reading of its provisions reveals that the Home Secretary has misunderstood the Act, in that crucially it does not mandate prohibition, but instead provides for meaningful controls across a vast range of policy choices; it is beautifully crafted to implement whichever measures reduce social harms most effectively. It is a neutral Act. It does not imply that the Home Secretary can exempt, for example, heroin dealers or cocaine traffickers from controls under the Act. It's neutrality also means it does not grant the Home Secretary the power to exempt similar activities involving the most socially obnoxious drugs of all: alcohol and tobacco. My private activities involving cannabis were harmless to society compared to identical activities with alcohol and tobacco. This double-standard cannot be enshrined in a neutral Act. Therefore, in my legal submissions, I alleged that successive Home Secretaries have abused their discretionary powers under the Act. With the help of the Drug Equality Alliance, I isolated three legal errors, which give rise to a litany of unfairness and irrationality, resulting in an arbitrary drugs regime causing the unlawful, unequal treatment of people engaged in identical activities with equally or less-harmful drugs than the most popular 'legal highs', alcohol and tobacco. This cannot be lawful. The unequal treatment I suffer is clear. In 2009, the supermarket behemoth Tesco was fined a meaningless £6000 and denied a liquor license for 28 days at its Blackpool branch, for "persistently selling alcohol to children". While for my private activities which do not involve the supply of addictive, lethal drugs, and which might be said to cause a social solution (pain relief) I face up to 14 years in prison. In 2009 the Home Office confirmed that alcohol and tobacco fall squarely within the remit of the Misuse of Drugs Act. Now that the government has finally admitted that alcohol and tobacco are harmful drugs, the question arises as to why users of safer alternatives are irrationally singled out. The government's answer came in a 2006 Command Paper, Cm 6941. In spite of its acknowledgment that “alcohol and tobacco account for more health problems and deaths than illicit drugs”, the government defended its provision of civil rights to alcohol and tobacco users on the one hand, versus its criminalisation of users of 'illegal' drugs on the other. The government did not justify this unequal treatment on the grounds of science, or for the protection of society. For the first time ever the government admitted that the inequality of treatment is based on "historical and cultural precedents." 'Historical and cultural precedents' are the stock-in-trade of discrimination, the justification for racism, sexism, homophobia and slavery. This is the 'reason' that smashed the genius of Oscar Wilde. The same 'reason' drove the criminalised homosexual Alan Turing, perhaps our greatest scientist, to depression and suicide. Today, this arbitrary justification continues to destroy the lives of thousands of ordinary people, while permitting identical activities with the most lethal drugs of all. Cannabis has never caused a fatality, where alcohol and tobacco cause over 150,000 deaths every year in the UK. At the High Court, I claimed that the government's justification for the inequality of treatment I suffer is irrational, unfair and illegal. I argued that it is disproportionately restrictive of my civil rights and freedom of choice to deny access to safer alternatives to alcohol; that it is invasive of my privacy, and abusive of my freedom of thought. I insisted that a fair trial was impossible, and asked the High Court to prohibit my trial. On July 1st, 2009, the High Court refused me permission for Judicial Review, ruling that there had not been an abuse of power even if the government did admit to arbitrarily prohibiting 'illegal' drugs on the grounds of 'historical and cultural precedents', rather than for the protection of society as the law demands. The High Court adjudicated that the law as applied to me, but not to users of the more-harmful drug alcohol was NOT discriminatory, and therefore was not unlawful. I was sent back to the Magistrates' Court, and committed for trial at Snaresbrook Crown Court. My trial began on Monday 26th April 2010. On the Tuesday, His Honour Judge Tudor Owen ruled that there had been no abuse of power by the Home Secretary, and even had there been, the Crown Court is not the place to rule that the law is wrong. The judge told me that the place to argue that the law itself is bad is the Court of Appeal. On the Wednesday, I was tried for cultivating cannabis. I represented myself, but was forbidden from defending on the grounds of medical necessity, that option having been eliminated at the Court of Appeal in 2005. I could not argue an abuse of power; the Judge having ruled that out the day before. I had no defence in law. There is another obscure option available for people who represent themselves: 'jury nullification'. For three centuries juries have had the power to pass a verdict on whether the law itself is wrong. The jury may acquit the defendant, regardless of the evidence or the facts, if they think the law is bad. Judges don't tell juries they have this power, so few jurors know about it, and lawyers are not permitted to mention it. Jury nullification would seem sensible for the purposes of damage-limitation. But, if the jury were to acquit me, my journey would immediately stop. Two years of groundwork, of developing and refining arguments, of trying to make an impact on drugs policy, would be over. I would be acquitted, but nothing would have changed. I still risk arrest, prosecution and jail if I dare to address my symptoms. Clearly, acquittal would be an unsatisfactory outcome. I felt that I needed to come out of my trial with more substance than the mere cessation of proceedings. What value is an acquittal if it affects nobody but me, and then only in the short term? Many thousands of people in similar situations to mine can't even stand up, let alone stand up for themselves in Court, so it falls to me to do it for them. The Judge's instruction that the Court of Appeal is the venue to challenge a bad law made it clear. Per His Honour's assertion, if I wished to take the matter forward to a potentially more meaningful conclusion for all of us, and not just for me, I would have to be convicted. Only then could I go to the Court of Appeal to exercise a Rizla-thin chance, but a chance nonetheless, at challenging a dreadful law. I took the stand determined to tell the whole truth. I argued on behalf of sick people and for adults who choose to relax in the evening with a safer drug than a glass of wine. I told the jury I agree with Professor Nutt, the former head of the Advisory Council on the Misuse of Drugs, who was sacked for making his scientifically-based opinions public. I admitted my sinful enjoyment of smoking cannabis; only when the pain subsides can I enjoy life. I explained how vicious the law is, how sick people like me, in addition to responsible adults enjoying a cultural choice, are caught in the law's dragnet for private, peaceful activities affecting nobody else. I told them that guilt is as appropriate to me as would be to them if they chose to brew a demijohn of wine; I had no option but to plead Not Guilty on principle. I said that my activities were partly an act of civil disobedience, and reminded the jury of the words of Martin Luther King - that it is our duty to disobey unjust laws. I repeated the directions of the Judge: that this Court has no power to rule on a bad law, or to make exemptions from it. I then relayed His Honour's assertion that the place to argue that the law itself is bad is the Court of Appeal. "...but I will not be asking you to do that today." "I want to go to the Court of Appeal, but if I am acquitted, that is the end of the matter, and I will be in the same position next week if I choose to grow cannabis. I will be liable to arrest, prosecution and imprisonment, and nothing has changed. My ambition is to challenge this appalling law, therefore I ask that you convict." "Ladies and gentlemen, if you have any sympathy for me, if you think it is unjust for sick people to be persecuted in this way, you will pass a verdict of guilty. Please help me out here today by convicting me." The jury returned after less than a minute to pass the verdict I had demanded of their consciences: Guilty. I flashed a grateful smile at the honourable twelve, and gave them two thumbs up. Most of the jurors returned my smile, apparently happy to have granted my wish. Thanks to government intransigence, my conviction is an opportunity to argue my case at the Court of Appeal, in an attempt to help myself and many thousands of people to live a better quality of life. Sentencing will take place at Snaresbrook Crown Court on 26th May 2010.